Jim Acher at Ocean Independence in Palma sends news of a mighty 30% price drop on his central listing, the 27.26m motorsailor Awol Again. Built to RINA class by Turkey’s Agantur Bodrum yard in 2004, she had an extensive refit in 2008. MCA compliant, Awol Again boasts a very successful charter record, sleeping eight guests in a full beam master suite, VIP and two twin cabins. 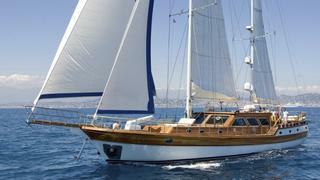 Awol Again has been immaculately maintained by her owners since new and is now down from €1.25 million to €900,000.